The industry's first recycled polypropylene top loading sheet protector! The industry's first recycled polypropylene top loading sheet protector! Made from 70% pre-consumer recycled content*. Because it's polypropylene, you'll never have to worry about photocopy transfer. Reduced glare finish aids in visibility under typical office lighting. Standard weight for an ideal combination of document protection and increased binder capacity. Top loading - No sheet punching necessary. 100/BX. *This product contains at least 70% material diverted from the solid waste stream and meets the FTC definition of recycled. It may not meet your state’s definition of recycled. 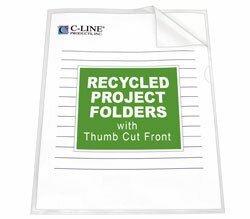 C-Line's sheet protectors are designed to protect your documents day after day, no matter how often they're handled. Sheet protectors offer an invaluable way to store hard copies of reports or invoices, for example, in order to have a back-up for reference purposes or to find things quickly. Using sheet protectors in conjunction with three-ring binders allows the material to be protected and withstand storage over time.